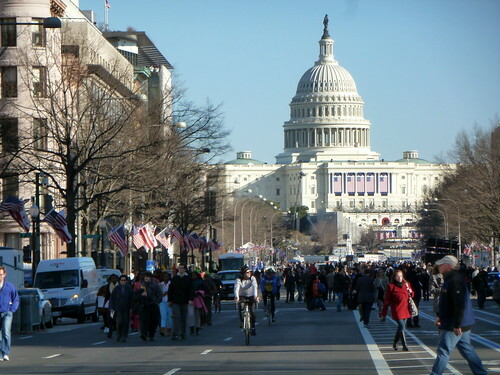 We have a day to enjoy Washington, DC before the Second Inauguration of President Barack Obama (love saying that), and I think we made the most of it. To start things off, we wandered on down to the White House, where they were setting things up for the next day’s parade review. Right off the bat, a weird thing was happening. I guess they were checking the sound system or something, and they had NPR blaring out across Lafayette Square. It’s Sunday morning, so that means Car Talk. Do I really need to hear about Vanagon repair techniques right now? (Maybe so. I like the Vanagon.) 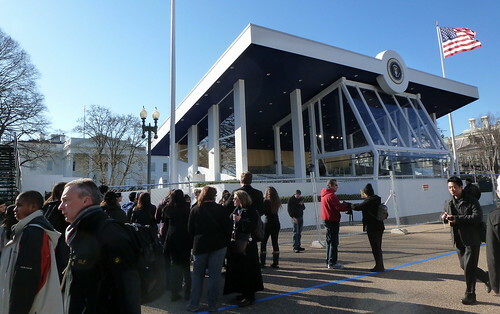 We were not deterred, and closely examined the President’s reviewing stand and other neat stuff. 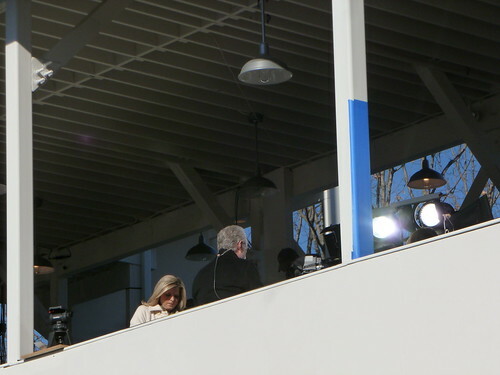 Two or three people were pointing excitedly to the media booth across the way, and we saw what appeared to be (and was later verified as) the back of Wolf Blitzer’s head with some other CNN personality. Whatever he was saying, it was probably more confusing and less helpful to the nation than the Car Talk segment about the Vanagon. Stopped off to look at the White House, since we were there anyway. The President was inside taking the oath of office from the Chief Justice of the Supreme Court at that time. Vice President Biden’s oath of office was administered elsewhere, at some point after Car Talk ended. 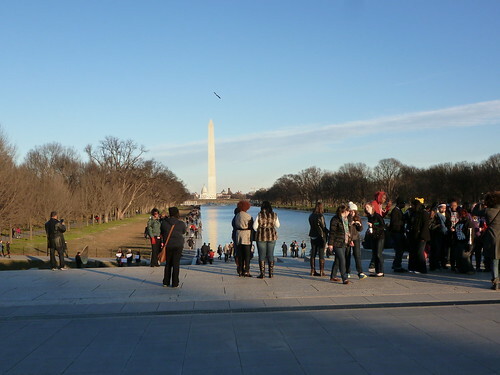 We ventured onward to the Washington Monument, scoping out locations for our camp the next day. My information gathering led me to believe that this area would likely be our best bet for viewing the ceremony. Seems awfully far from the Capitol when you’re there. It’s about a mile away. About this time I get a text from The Letter: “At the Castle”. He’s either miniature golfing, or has arrived at the Smithsonian. We begin angling towards the SI, and see a small crowd gathering on the Mall in front of something. I need to see what this is: right now it’s something I don’t yet know about, and I must erase this knowledge deficit. Turns out it’s a CNN structure with several CNN blowhards in it, and the crowd is waving and shouting, clamoring to be seen on TV. Did that sound judgmental? So be it. We headed over there, to see if we could get on TV. 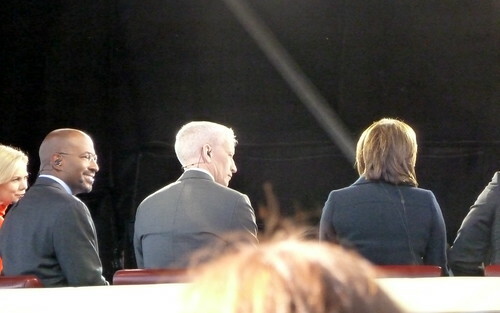 Saw Anderson Cooper. Right on. It turns out that I can handle CNN in real life just about as long as I can on TV, and so we strayed off towards a park bench. Resident Expert saw that the people who had just vacated it had left behind a backpack. She ran after them to let them know. Good deed for the day. The fellow on the bench next to us worked for CSPAN, as I could see by his outfit, and I engaged him in some casual banter. He was a friendly bloke, and was most encouraging about what we’d experience on Inauguration Day. Do you like CSPAN? Mellowcat does. During our chat, The Letter and his team walked up to join us, even though they didn’t know where we were. Kind of surprising, and also not so, that this happened. 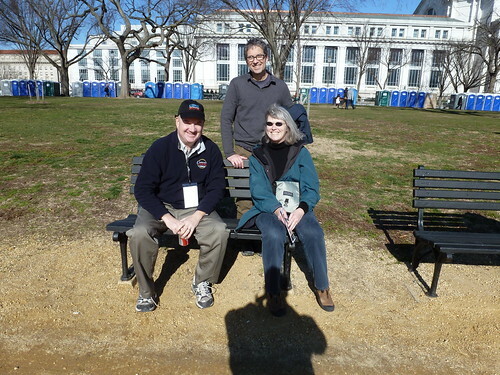 Next, we took a look at the setup at the Capitol, and then found a place for lunch nearby. The Capital Grille, it was called. Some of us felt that it might have been a Republican kind of place, maybe because of the aged beef suspended in the front windows. They say they like the red meat. But it was a very nice lunch. The waiter told us the restaurant was rented by some high roller on Inauguration Day for him and his friends to watch the parade. That turned out to a big-time Democratic lobbyist named Patrick Murphy. Looks like red meat’s back on the menu. We strolled on up Pennsylvania Avenue, stopping to look at the newspapers at the Newseum. 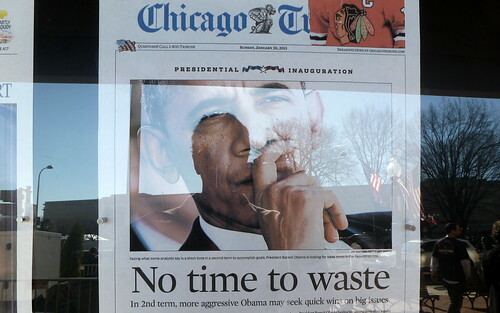 They have the current day’s front pages from each of the fifty states displayed out front. Interesting to see how the Inauguration news was handled around the country. Here’s the President’s home town paper. The front page adjacent to Illinois was from one of your redder states, and it devoted the above the fold space to a story about a guy who shines shoes in a local hotel. Didn’t mention the Inauguration elsewhere, that I could see. I suppose they’re trying to pretend that it’s not happening. 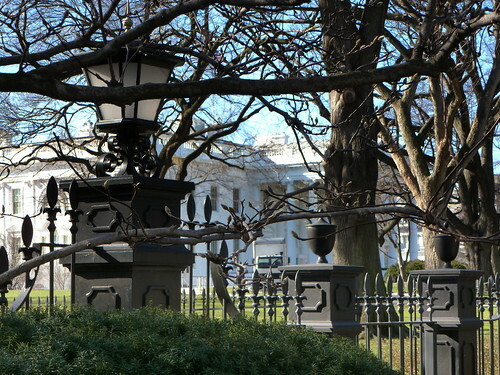 On we walked, past the White House again, and towards the Lincoln Memorial. 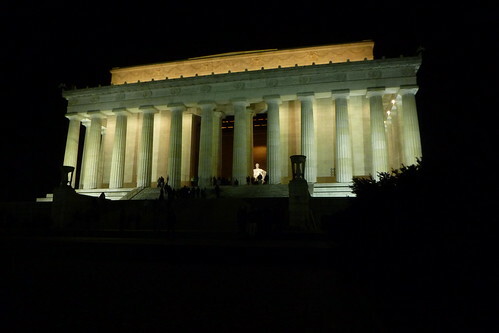 Probably my favorite place of any on the National Mall. It’s such a great view at any time from the steps of the Memorial, but today, with the late afternoon sun angling across the scene, it was spectacular. We thought we might have a special treat when the Boston College marching band arrived and started gathering on the steps. They filed on up, with the tubas and everything, but it turned out to just be a photo opportunity. They took their pictures and left. BC Screaming Eagles, you disappoint me. From there we made our way back to the hotel for refreshments and dinner, which was at a bookstore and cafe near Dupont Circle. We had a short wait for our table, and so I looked up references to my ancestors in the index of Team of Rivals. One of them accompanied Lincoln from the train station to the Willard Hotel before his first Inauguration. See, we’re helping! After dinner we walked back down to the Mall to visit the LincMem again. Just a few of us Lincolnites around at this late hour. But old Abe is always there. I had an interest in getting a drink at the Round Robin bar at the Willard, so we started back that way. The security barriers and roadblocks were going up in earnest now, and we almost got stuck on the wrong side of the Mall. Guys were hitting the manhole covers with sledgehammers, I suppose to look around below ground for bad guys. Just passing through! 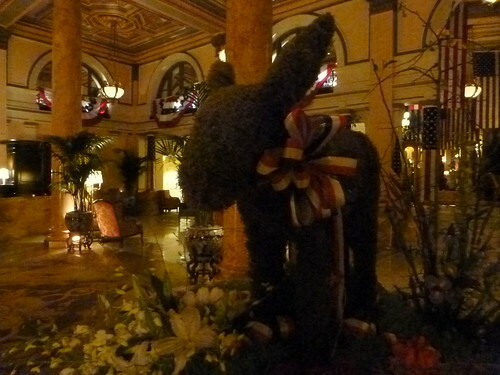 We found the Willard and peeked into the Round Robin, but it was jammed with fat cat politicos so we didn’t stay. The lobby is nice though. Still on the prowl for that drink, and we aimed back towards our hotel. Along the way we saw Tom Daschle leaving a party. He was hobnobbing with well-wishers. We bought some chocolate truffles at a Walgreens and enjoyed those with our Jameson at the Marriott bar. God bless America.